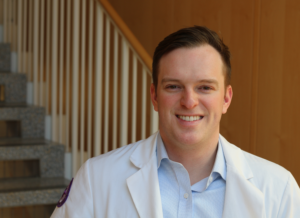 Andrew Furman is a third-year student in the MD/MBA dual-degree program and prior board member of Second Opinions, a pro-bono healthcare consulting group started by medical students. Andrew Furman, a third-year student, has capitalized on the breadth of opportunity at Feinberg. In addition to his clinical and educational responsibilities in the MD/MBA dual-degree program, Furman is a consultant and prior leadership board member of Second Opinions, a pro-bono healthcare consulting group started by medical students. Through the student organization, Furman was able to apply classroom concepts to a real-world environment, working with Erie Family Health Centers to optimize growth strategy and workflow. While his interests primarily lie in how financial incentives impact behavior throughout the health system, Furman believes the lessons he’s learned will help him make more informed decisions and deliver better care throughout his career. Read a Q&A with Furman below. In addition to Feinberg’s strong clinical and academic reputation, the opportunity to live in Chicago was a major selling point. Chicago has endless neighborhoods to explore and communities to join, as well as a great music, comedy and entertainment scene. Moreover, as a student interested in healthcare policy and management, the MD/MBA program offered through the Kellogg School of Management presented an unparalleled opportunity to see how care is coordinated and delivered within the hospital both from a provider and systems level perspective. What are your medical or research interests? In college, I became fascinated with healthcare as an institution and the way our current system has evolved over time. In particular, I am interested in how financial incentives impact stakeholder behavior, from hospitals, physicians and insurers to average Americans seeking medical care, and how we can use this knowledge to promote behaviors that lead to desired clinical outcomes. My involvement with Second Opinions has allowed me to develop consulting skills while gaining hands-on experience tackling strategic problems in healthcare. This organization has also helped me make connections and give back to the Chicago community. In particular, I appreciated the opportunity I had to build a longitudinal relationship with one of our clients, Erie Family Health Centers. They are a federally-qualified health center with 13 locations serving over 70,000 patients in the Chicagoland area. Thus far I have had the opportunity to work on three growth strategy cases with them, each project building off our prior work. This has given me the opportunity to see how organizations develop and act on strategic plans over time to grow and respond to the changing healthcare landscape. Furthermore, as my role on these projects has evolved from analyst to manager and now to advisor, I have a newfound appreciation for team dynamics, workflow and management. What advice would you give to prospective medical students? Keep an open mind — or as one of my mentors once told me, “Never walk past an open door without peeking in.” It’s impossible to understand the nearly infinite number of possible careers one can have in medicine today, and as a third-year student I feel as though I have barely scratched the surface. Take advantage of any opportunity you have to explore or try new things. The more experiences and data you can draw on, the more confident and informed you will feel when you are making crucial decisions about your specialty choice and practice type. It extends beyond career decisions, too, as you can incorporate these lessons into patient care, research, teaching, policy and leadership during the course of your career.